Next is to submit your website to Google AdSense. Dont worry if your application got rejected .I have tried many times till I got approved. You now have access to your new AdSense account where you can accumulate earnings and set up and track your YouTube payments. 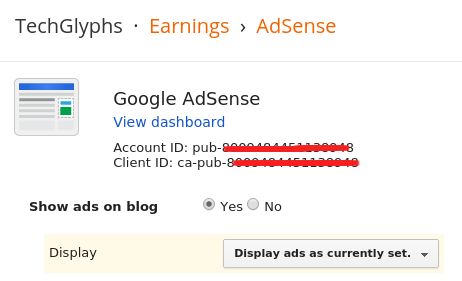 In your AdSense account, you will be able to track your earnings as the “Hosted AdSense for Content” product on the “Home Overview” and “Performance reports” pages of your AdSense account. You may see additional earnings from DoubleClick and other third party ads served on your YouTube channels and/or videos. This data will show as 'YouTube' on the 'Payments' page of your AdSense account. this is just the email you will see after approval. Now the trick.If you are disapproved by Google. Try to get approved through Google partners like YouTube. Upload any good video and once it reach more than 1000 view YouTube will send you link for monetizing . This is very very important---don't try to use old/rejected google AdSense account with request from YouTube. create a fresh adsense account to apply for approval. Once you get approval mail go to here. You can use this Publisher id in any of the Google partner domain.